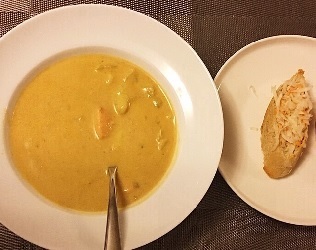 This is such a quick and easy fish soup recipe which was enjoyed for a meal in the winter or on a cloudy cold, spring day. The tinned lobster bisque soup adds a deep luxurious flavour which is made more indulgent with the addition of cream and brandy. My children find the base flavour of the soup quite intense, so adding a little brandy and cream won them over. I had a jar of rouille, in the cupboard, it is a mayonnaise flavoured with garlic, tomato puree and cayenne pepper that they use with bouillabaisse soup. I served the soup with slices of baguette and grated cheese. Traditionally in a bouillabaisse-style soup, you would use melted gruyere cheese but I had a piece of Comte in the fridge which worked well. A delicious quick and easy fish soup that is made in minutes and can be enjoyed as a main course or starter. In a large pot add the cubed potatoes, the stock cube and just enough water to cover the potatoes. Add the brandy and simmer for a minute. Stir in the soup and heat gently, add the milk and cream and stir. Just before serving add the fish and simmer gently for a few minutes, Lift the fish out and ensure the pieces are cooked through before serving. Serve with sliced baguette, rouille and grated gruyere cheese. The recipe can easily be halved. Use as much or as little fish as you like. Next time you need a very quick dinner or looking for something a little different to do with a packet or two of fish pie mix I hope you try this recipe.